The first British sports car I ever owned was a Sunbeam Alpine identical to this one. I chose it for a very non-car geek reason. My grandmother worked as an executive secretary for its importer, Rootes Motors, in NY. (My grandmother, although employed in the auto industry, was far from being a car geek. In fact, she didn't even start driving until she was in her late sixties, after my grandfather died. Although she had a drivers license for all of her adult life, she never drove and it soon became very clear that putting a frail old women - whose last driving experience was probably some 50 years prior, when taking her road test in a Model T Ford - behind the wheel of a big V8 Buick was not a really good idea. Grandma's cruising days were short lived.) My grandmother would occasionally bring home Sunbeam / Hillman brochures and I'd thumb through them when visiting her. I thought the Alpine looked cool. When I decided to buy a British sports car I remembered all the cool pictures of Sunbeam Alpines I had seen as a little kid and decided that was what I was going to buy. That may not be the best reason to buy a car, but it was a decision I never regretted. The Sunbeam Alpine roadster was first introduced to the world in 1959. It was aimed at the US market, as we had fallen in love with British roadsters. It was meant to be a more civilized alternative to the MGA and the Triumph TR3. With roll up windows, a heater as standard equipment, tube shocks all around and a (comparatively) easy to use top, it was far more civilized than its competitors (although Triumph and MG finally added roll up windows on the TR4 and MGB). It's big letdown, at least initially, was performance. Being slightly heavier than the Triumph TR3 and MGA and having only a 1500 cc engine, it was slower than both those cars. The Alpine was improved over the years and by the time the Series V was introduced, with a 1725 cc engine, it was competitive in every way to the MGB and could hold its own against the Triumph TR4. The Sunbeam Alpine is a very good roadster that is just now getting the recognition it deserves. There are few weak points to an Alpine. The 1725 engine is durable, as is the transmission and differential. The biggest problem is the body, which is prone to rust, especially along the rockers. Parts, especially body and trim, are getting very hard to find, but mechanical parts, though not as plentiful as Triumph or MG parts, are easier to come by. Besides the Sunbeam I've had a bunch of Triumphs and MGs in my life. If I was going to buy another 4 cylinder British roadster, I'd probably buy another Sunbeam. They're good looking, tough old cars that don't require a ton of maintenance and are a lot of fun to drive. It doesn't get much better than that. The car listed on eBay is a driver in good overall condition. The engine has been rebuilt. The seller mentions a few things that need to be repaired, but none of them are so important that you couldn't drive this car the day you buy it. Click here to see the eBay listing for this 1967 Sunbeam Alpine. Click here to read more about the history of the Sunbeam Alpine. Click here to find the Sunbeam Alpine Owners Club of America website. 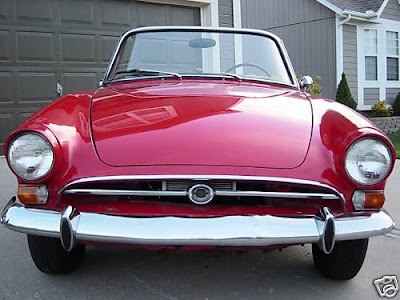 Sunbeam Alpine parts can be found at Victoria British and Sunbeam Specialties. When I had my Alpine there was a guy in PA selling parts who called himself "Tiger Tom". Besides having a good supply of parts he and his wife, whose name I've forgotten, were a wealth of information. When I was was restoring my second Alpine (my first one was wrecked shortly after I bought it), I was on the phone with them 2 or 3 times a week asking questions, looking for parts, or just getting advice, sympathy and encouragement. They were unbelievably friendly and helpful. I don't know if Tom is still in business or not, but if he is, buy your parts from him. That's not a knock on the other two places I listed, they're very good, I just know that Tom helped me and many other Sunbeam owners over the years and he deserves the business. Nice car but I'd hold out for a Tiger. I've owned a MkI Tiger and a SV Alpine (Lucky me). Both are wonderful cars - and I still love the way they look.